If ever there was a role tailor made for Katherine Hepburn, it was Tracy Lord in George Cukor's The Philadelphia Story. An imperious socialite with glamor to spare, Lord is a sparkling, strong-willed creation that could only have flown from the mind of Hepburn. And indeed, she spent a great deal of time developing the character with playwright Philip Barry before originating the role on Broadway. Lord is her's through and through, the quintessential Hepburn character; wealthy, beautiful, sassy, and very much used to getting her way. Things don't quite go the way she expects, however. On the eve of her wedding to George Kittredge (John Howard), her ex-husband, Dexter (Cary Grant), is sent by "Spy" magazine to cover the "wedding of the century," along with unscrupulous photographers, Macaulay (James Stewart) and Elizabeth (Ruth Hussey). Dexter has a plan to win Tracy back, but his plans go hilariously awry when too many glasses of champagne lead Tracy and Macaulay down the primrose path of love. Caught between three men, Tracy must decide if she wants to be loved as an object to be admired, a goddess on a pedestal, or simply as herself, apart from the facade she so carefully built up. The Philadelphia Story is a constant delight, a witty and mannered screwball comedy taken from a sharp script by Donald Ogden Stewart. Hepburn fought hard for this film, and it shows. While I've always preferred Howard Hawks' more energetic Bringing Up Baby (1938) the film was a flop upon its release, and The Philadelphia Story was the vehicle designed to return Hepburn's star power to its former glory. The gamble worked, and she was no longer considered box office poison after its success. Of course, what really sells it are the performances. While Grant had top billing (a concession by Hepburn that helped convince him to take the role), he cedes the spotlight to Hepburn and Stewart, slyly stepping back with a smirk and a twinkle in his eye. Stewart won his only Oscar for his work as Macaulay Conner, a boy from the wrong side of the tracks with a healthy distrust of the upper class. His drunken scene with Hepburn is the film's comic highlight, and it simply glistens with understated wit and innuendo. Cukor was a master when it came to upper crust wordplay (see also Dinner at Eight), and what makes his pictures truly sing is how he subverts upper class societal conventions without making them a target for ridicule. It's a delicate balancing act, but he pulls it off beautifully. The result is one of cinema's most dazzling comedies, a whirlwind of breathless wordplay and effortlessly beguiling performances whose charms haven't faded in the nearly 80 years since its original release. It has also never looked more beautiful than it does on Criterion's new Blu-Ray, where its crisp black and white cinematography really pops. It's a sharp transfer that never loses its filmic luster, making it the best presentation the film has seen to date. 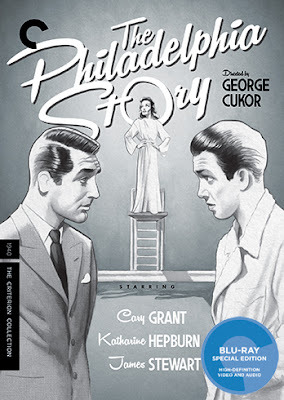 THE PHILADELPHIA STORY | Directed by George Cukor | Stars Katharine Hepburn, Cary Grant, James Stewart, Ruth Hussey, Virginia Weidler, Mary Nash, John Halliday ,Roland Young, John Howard | Not rated | Now available on Blu-Ray and DVD from The Criterion Collection.